Almost new home in Legacy Park! - Welcome to Legacy Park in Casselberry. We are excited to have you visit this MOVE IN READY TWO STORY HOME with a TWO CAR GARAGE. The THREE BEDROOMS, TWO AND A HALF BATHS and a LOFT offer versatility for your family. The home is only four years young and is luxuriously appointed with a SPACIOUS KITCHEN with CLOSET PANTRY, breakfast bar, separate eat-in space large enough for the big table, GRANITE counter tops and a pretty back splash. All of the kitchen appliances you see are staying with the house as well as the washer and dryer that you will find in the INSIDE LAUNDRY ROOM just off of the kitchen. The kitchen opens to the Great Room and there you will find a sliding glass door that will bring you out to the LARGE SCREENED PATIO which overlooks your FENCED IN BACK YARD perfect for children, pets and parties or just to enjoy some peace...Ahhhhh! You find your private master suite on the second floor so you can get away and relax when everyone else is wide awake and playing. 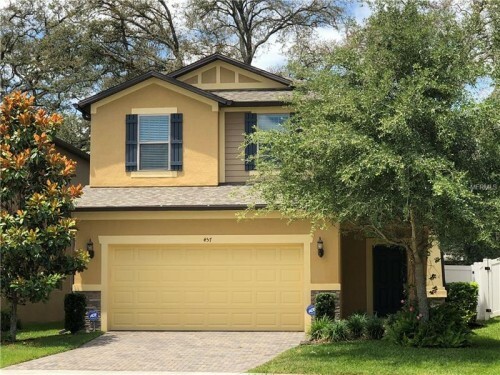 You will be close to Target, Home Depot, Many Grocers including Whole Foods, The NEW Geneva School, Public Schools, Major highways including I-4 and 417. Honey, You Are HOME! Park Place Real Estate, Inc.